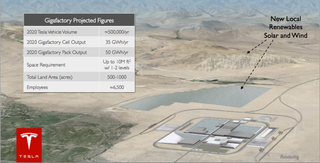 Included in a deal by the Nevada legislature that set aside $1.3 billion dollars in tax cuts and other incentives for Tesla's massive lithium ion gigafactory is a bill that allows Tesla to sell their cars directly to customers in the state. Victory: Tesla. Automotive News reports that Nevada governor Brian Sandoval signed legislation after the 42-member Assembly and 21-member Senate unanimously agreed to write off Tesla's sales taxes for 20 years and property and business taxes for 10 years. The tax breaks are the centerpiece of a deal that Sandoval and Tesla CEO Elon Musk unveiled Sept. 4 to land the first battery "Gigafactory" to supply 500,000 cars. The biggest chunk of the deal, Tesla's sales tax exemptions, is worth an estimated at $725 million. In addition, the company would save more than an estimated $300 million in payroll and other taxes through 2024. Lawmakers also passed an exemption that will allow Tesla to bypass the current law that requires an automaker to sell cars through franchised dealerships. Nevada's willingness to allow Tesla to sell direct is another reason why Nevada may have had the edge over Texas. For Nevada, the Tesla deal is an opportunity for economic recovery. The economic collapse and the housing crisis had devastating impacts on the state; Nevada currently has the third highest unemployment rate in the United States. The 5 million-square-foot factory will create an estimated 3,000 construction jobs, 6,500 factory jobs and 16,000 indirect jobs once completed. This is arguably the biggest thing that has happened in Nevada since at least the Hoover Dam," the mammoth Depression-era project on the Colorado River that employed thousands and provided hydro-electric power to the state in the 1930s, said Assemblyman Ira Hansen, a Republican from Sparks. Written into the legislation is a provision that requires at least half of all workers hired by Tesla be Nevada residents, though it allows for waivers.